We need your support on World Encephalitis Day! Eight out of 10 people do not know what encephalitis is  and World Encephalitis Day on February 22 aims to change that. Will you get together with friends, family and colleagues and add red to your day? Whether it’s a red hat, a crimson dress or scarlet socks, however you decide to wear #RED4WED you’ll be supporting our life saving work. 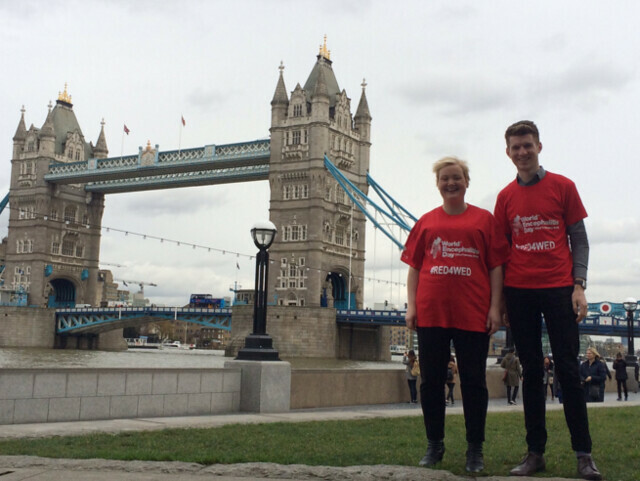 Our limited edition World Encephalitis Day t-shirts are also available. Here are some more simple ways you can make #RED4WED truly memorable. Persuade your workplace or school to wear #RED4WED for a gold coin donation. Organise a neighbourhood walk with everyone wearing red, including your pets! Arrange for your local gym or exercise class to wear red and donate their takings for the day. Sign up to our Thunderclap campaign! Share with your friends, family and colleagues. Help us smash our target! This project is supported by a charitable donation from Pfizer Ltd.
We are grateful to wearelumiere.com for their continued support of this project. All figures, unless otherwise stated, are from YouGov Plc. Sample sizes and 2017 field work dates varied according to country (Five countries were surveyed: UK, USA, Germany, India, and Australia). By people we mean adults (aged 18+) in the general public. The 8 out of 10 people statistic is a mean of the five countries surveyed and was calculated by The Encephalitis Society by identifying incorrect answers to the YouGov Plc survey question ‘in your own words, please type in the box below what you understand the word encephalitis to be/mean’ and reflecting this information in a recalculation of YouGov Plc’s question ‘yes I have heard of encephalitis and know what is it’.